Great film by the French producer, Pier Rehov, answers the UNESCO Jerusalem resolution. The Sifting Project appears all over the film. As we explained in our last post, during the final week of Ramadan, the Muslim Waqf made use of the closure of the Temple Mount to all non-Muslims, and limited police presence, to move the remaining mounds of soil that were originally excavated, along with the material we have been sifting, in 1999 and the early 2000s. This material contains a huge amount of artifacts from all periods of the history of the Temple Mount, including the First and Second Temple periods. This material SHOULD be sifted by the Temple Mount Sifting Project, and legally, we are the ones with the rights to move, sift/excavate, study, and publish this material. Yet again, illegally, the Waqf, with dozens of volunteers and workers, carried out excavation work, earth and stone clearance on the Temple Mount. According to the video we received last week, there was illegal movement of soil, stones, and artifacts from the large dirt mounds on the Eastern side of the Temple Mount. Stones were collected and used to build terraces and little walls to outline new walkways. According to Arnon Segal of Makor Rishon, the Waqf also erected a monument in memory of the Gazan paramedic, Razan al Najar, who was killed two weeks ago in the clashes along the Gaza border. As we mentioned in our previous post, there is a supreme court ruling that prevents these mounds from being removed without archaeological supervision. Muslim authorities object to any archaeological work on the Temple Mount, so since 2004 no debris has been removed from the Temple Mount, and all material from renovations and other work has been gathered in these mounds. This morning, our director Zachi Dvira went up to the Temple Mount to assess the damage. The good news, if there is any, is that for most of the mounds of soil, only the outer layers seem to be damaged. We have evidence that the workers scraped the sides of the mounds and sorted finds, including some larger architectural fragments and floor tiles. The bad news is that there are four places where the Waqf not only “cleaned” the mounds on the surface, but yet again dug into the interior of them. This is clearly a show of who is in control, and a message from the Waqf to the world that they don’t need permission from Israel to do anything on the Temple Mount, and that no one can stop them. The video from last week also showed ancient slabs being sorted and removed from the mounds. Who knows what else was discovered, and what else we won’t be able to study from this unsupervised work. Since the early 2000’s, near the Golden Gate, there was also a large heap of architectural fragments (mainly made of marble) that came from the dismantling of all sorts of ancient structures on the Temple Mount during past renovations. Many of these architectural fragments were probably dismantled in renovations 100 years ago, kept in storage, and then discarded to the trash heap in the 1990s. While looking at this heap in 2013, we discovered Early Islamic period inscriptions, Second Temple floor tiles, Byzantine church chancel screens, and other important artifacts. We published it and no one did anything about it. Today’s visit, and another conducted several months ago, revealed that 3/4 of that material is missing. Where all of this archaeological material is now is a complete guess. We fear that these important artifacts have been lost due to looting. None have yet been turned over to archaeologists. We condemn the use of Ramadan and the lack of Jews and Israelis on the Temple Mount to obfuscate the goings on of the Waqf. For years, the Israeli Police have had some success in preventing work in these piles of soil. In the past, when attempts were made to remove these mounds of soil, we were also alerted to the attempt in time to save the mounds so that they can be properly and legally excavated and studied. The police released a statement saying that they will make sure that the earth that was removed is returned to its place. We are grateful to the police for making such a strong statement and upholding the law. However, while this is great in theory, the looted artifacts will never be returned, and it is impossible for the soil to be replaced perfectly. The changes in the earth mounds will disrupt our ability to separate the sources of the debris during their eventual excavation. We had hoped to conduct a controlled removal of the soil and study the separate sources of the debris from which these piles are composed. This could lead us to a more accurate understanding of the original provenance of all of our artifacts and help us reconstruct what the Temple Mount looked like, and how it was used, in different periods. In 2018, this should not be a problem. Taking advantage of the limited police, and ban of all non-Muslims from the Temple Mount because of Ramadan, these archaeologically rich mounds of earth have been irreconcilably damaged. This is a clear violation of the law, a violation of basic morality and respect, and an absolute destruction of the heritage of Jews as well as Christians and Muslims. This constitutes a decade’s worth of regression in the level of enforcement of the antiquities law on the Temple Mount and needs to go viral so that the world can see what the real status quo is on the Temple Mount. Please share this information and communicate it to the media and government officials. Make this story go viral. A very serious incident occurred in the last few days on the Temple Mount. In the eastern part of the Temple Mount, there are mounds of earth from various illegal excavations carried out by the Waqf on the Temple Mount in the early 2000s. This is the latest of many attempts to remove this earth. The Waqf attempted to remove the mounds from the Temple Mount in 2004, in coordination with the police and Israel Antiquities Authority, but without supervision. Fortunately this attempt was forestalled by a petition to the High Court of Justice filed by Committee for the Prevention of Destruction of Antiquities on the Temple Mount. The court ruled that the earth can only be removed under archaeological supervision and with coordination with the Committee. It should also be noted that according to an internal report written by the Israel Antiquities Authority in 2016, the excavation permit, given to us allowing us to sift the earth that was removed from the Temple Mount at the end of 1999 and at the beginning of 2004, also applies to these mounds that were just disturbed. A controlled removal of these mounds would enable extrapolation of the separate sources of the debris from which these mounds are composed. Such a dig could provide us with much more accurate information than we currently have in studying the findings from sifting the soil that was dumped into the Kidron Valley in 1999. The information that could emerge from sifting these mounds would complement the information we currently possess and would enable us to draw a clearer, larger picture. For years, the Israeli Police have had some success in preventing work in these mounds of soil and debris. In 2013 there was an attempt to remove them by truck and tractor on the false grounds that only park waste was removed, but thanks to the media, we were able to stop the works. Now, during the last days of the month of Ramadan, when the Temple Mount is closed to non-Muslim visitors and police presence is limited, over a thousand people carried out excavation work, stone clearance, and the creation of terraces in these piles of earth! This is a clear violation of the High Court’s order. This constitutes a decade’s worth of regression in the level of enforcement of the antiquities law on the Temple Mount. The changes in the earth mounds will disrupt the ability to separate the sources of the debris during their eventual removal and archaeological excavation. Furthermore, during the course of such a manual excavation as just occurred, many archeological artifacts are routinely discovered. It is highly doubtful that any such items will reach the hands of archaeologists. * Please share this information and communicate it to the media and government officials. This is important and needs to go viral. Hello everyone, we have some news to share with you. The Temple Mount Sifting Project is renewing its activity outside the lab! For the first time in the history of archaeological research in Israel –the site will be coming to you. 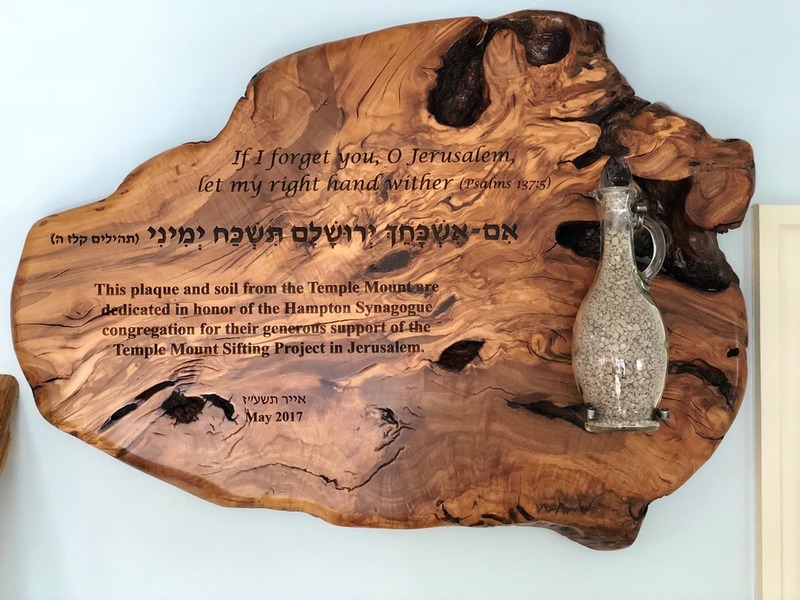 We will be bringing the antiquities-rich soil that was illegally removed from the Temple Mount in the late 90s to various communities and institutions throughout Israel. Students and volunteers will be able to sift through this material and take part in the important work of recovering the ancient artifacts within. A sifting activity was undertaken yesterday in the Yeshurun School in Petach Tikva – but this is just the beginning! We’ve already started taking requests from other communities throughout Israel. This new archaeological program focuses on sifting the remaining earth from Solomon’s Stables that was illegally bulldozed from the Temple Mount in the late 90s. We’ve always encouraged our volunteers to take an active role in the salvage of artifacts buried in this soil, and over the years we’ve involved an unprecedented number of volunteers in our work. Because it is a sifting project, which can accommodate larger crowds than a traditional excavation, over 200,000 people have participated – a world record in archaeological research both in Israel and worldwide. Now, our project has been transformed into a mobile activity which can traverse the country and engage various schools, institutions, and communities. The mobile sifting is accomplished by loading the soil onto a truck in large sacks which are then brought to the community’s site where sifting stations and a water system are set up. Each group or class participates in an activity that lasts for 2 hours (1.5 in the schools) and includes an educational presentation of the archaeology of the Temple Mount and the story of the Sifting Project. Then, the volunteers sift through the soil, collecting all the archaeological finds, which fascinates young and old alike. We hope to reach every sector of society – Jews, Christians, and Muslims, religious and secular. The history of the Temple Mount shows that the Mount was an important center of activity for all the monotheistic religions for over three millennia. We hope that we will receive the promised government funding soon. However, we will most likely need to set up some sort of matching program to continue with this mobile sifting program. If you would be interested in helping to sponsor a school or community, please be in contact with development@tmsifting.org. In addition to resuming the sifting, in honor of Jerusalem Day, we’ve agreed to share with the public some of the special finds that they are currently researching. The sifting yielded a collection of over 6000 ancient coins, some of which were the first minted in Jerusalem, and by Jews. These rare coins were minted in Jerusalem in the end of the fourth century BCE, when Jerusalem served as capital of the semi-autonomous “Yehud” province of the Persian Empire. The coins were modeled after the most popular coin of the time – the Athenian Obol. The Jerusalemite coins copied the barn owl from the Greek coin, but changed the Greek letters ΑΘΕ, short for the name of the city of Athens, to the ancient Hebrew letters יהד – a short form of the name of the province Yehud Medinta. These coins mark the transition in trade from the use of gold, hacksilber (silver pieces), or other commodities to using a monetary system regulated by the authority which minted the coins. Three of these Persian Period coins were found in the sifting of the Temple Mount soil, and another two tiny silver coins, too worn to read, are suspected to belong to this type as well. These coins are very rare. Not including those found by the Sifting Project, in the history of excavations of ancient Jerusalem, only five other such coins have been found. The relatively high number of such coins found by the Sifting Project is a result of the wet-sifting methodology perfected by the project, and the fact that the Temple Mount functioned as an administrative and commercial center during the early days of the Second Temple in addition to being the site of the Temple itself.